Committed to packing light? Few things lighten the load more quickly than swapping your usual trousers for an awesome pair of travel pants. If you’re like many travellers, you probably didn’t even know such a thing existed. I mean, pants are pants, right? Looking to gear up your female travel buddy? Check out this guide to the best travel pants for women! Before we get into the nitty-gritty, I’m sure there’s a burning question running through your mind: What makes travel pants so special? Let me answer that question with a scenario. So, you’re out and about in Jakarta, and it’s (as usual) steaming hot. You’ve got your board shorts packed from your time in Bali, but, unfortunately, you realize that type of relaxed style’s not going to cut it in more conservative Java. Maybe you’re wearing your favourite pair of jeans. You walk a couple blocks. The sweat is already starting to build. The discomfort is mounting. And then, of course, the afternoon thunderstorms suddently roll in. Standing underneath a tin-roofed food stall on the side of the road, weighed down by your completely drenched denim, you wonder if there’s a better way. Picking up a pair of the best men’s travel pants eliminates many uncomfortable hassles like this. Proper travel trousers are lighter, more water-resistant, quicker-drying, and infinitely more packable than run-of-the-mill denim or cotton pants. The top picks even offer other convenient features like security-zippered pockets to protect the most important valuables in your travel gear. 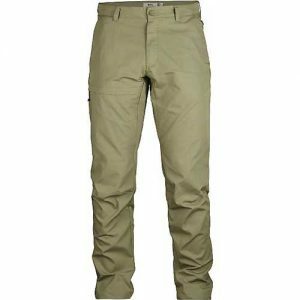 In this list, I’ve focused on travel pants for casual use rather than those specifically designed for the outdoors. Most, however, offer many of the same features as hiking pants such as water-resistance, packability, and fast-drying capabilities. The added bonus here is, of course, a dash of extra style that moves seamlessly between the trails and the streets. Although originally designed with hikers in mind, the Patagonia Quandary presents one of the most versatile and stylish pairs of travel pants for your next adventure. The secret sauce lies in the stretch-woven nylon fabric, laced with a touch of spandex to give you plenty of room to maneuver whether you’re on a mountain trail or ambling between museums in your favourite city. Not only is the fabric flexible, it’s durable and (somewhat) weather-resistant. It’ll hold up in a drizzle, but I wouldn’t count on it to keep you dry in a raging rainstorm. These pants are, however, quick-drying. Should you happen to get caught outside in a downpour, rest assured that you won’t be out of luck too long. Aside from the stretch fabric, the gusseted crotch and articulated knees on the Patagonia Quandary add to the pants’ ability to achieve a full range of motion. Several pockets—including two handwarmers (one with a coin pocket), 2 rear pockets, and 1 side leg pocket with a security zipper—allow you to keep your travel essentials organized. Add to all of this its UPF 40 sun protection, and its easy to see why these travel pants are the perfect companion for a sunny day inside or outside of the city. Before committing to this pant, be aware that the Patagonia Quandary is relatively slim and straight-legged, and best-suited for travellers sporting a lean or medium build. Athletic-bodied and larger-framed men will need to look elsewhere. 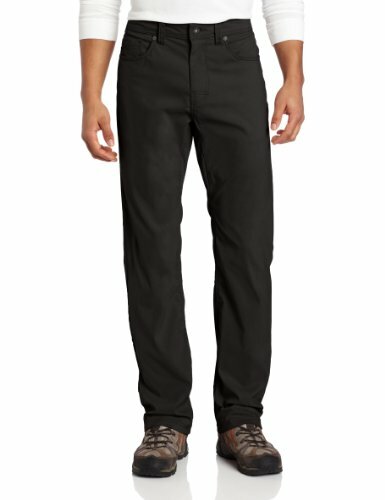 If you’re looking for some of the best value among men’s travel pants, the prAna Brion is a force to be reckoned with. The lightweight and breathable prAna Zion fabric is both weather- and abrasion-resistant and feature UPF 50+ sun protection, making these pants perfect for tackling the great outdoors. The real boon is the versatility of the prAna Brion. Although they’re rugged enough to withstand anything that nature throws at them, they’re also stylish enough for the street. The wrinkle-resistant fabric is especially awesome for backpackers who don’t have the luxury of carrying around a travel iron to keep their trousers nicely pressed. They’re even quick-drying, a feature you’ll love when laundering your clothes the day before moving elsewhere on your journey. 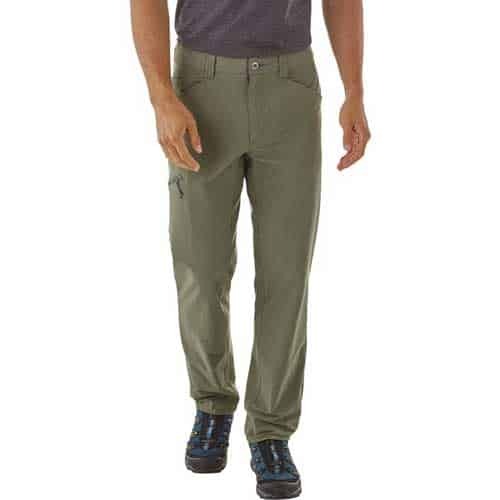 What you’ll immediately love about the Royal Robbins Alpine Road is that it’s a pant for trekkers that doesn’t look the part. Whereas most hiking pants feature cargo pockets and a fit that’s anything but endearing, these men’s travel trousers ditch the baggy look for a cool casual style that keeps you looking great on your journey. Built with their Active Fit nylon & polyester blend with a touch of spandex, the Royal Robbins Alpine Road focuses on performance. The gusseted crotch and articulated knees combined with the 4-way stretch fabric allows the fit to stay slim while not reducing your range of motion as you ply through the trails or the streets. It’s also quick-drying, water-resistant, and features UPF 50 sun protection for a further performance boost that’s perfect for travellers on the go. 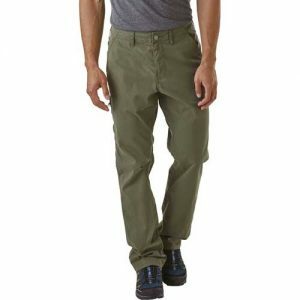 Even if you aren’t overly active in the outdoors, the Royal Robbins Alpine Road makes for a superb overall travel pant. The fabric is lightweight, packable, and wrinkle-resistant, wasting no time between coming out of your backpack to providing you with the style you need to hit the town for some sightseeing. For hot climates, there’s hardly a better travel pant than that KUHL Konfidant Air. These trousers hold true to their name, holding true to its mission of keeping you cool when the going gets tough. The key on the KUHL Konfidant Air isn’t just the lightweight, quick-dry fabric; the comfort is boosted by the knee and crotch vents that provide better airflow that you’ll find on most travel pants. When you’re travelling in a place like Southeast Asia, you’ll simply cherish that extra breeze. Another bonus with this pant is the looser KUHL Klassik fit. Designed with the needs of athletes in mind, the KUHL Konfidant Air adds slightly more leg circumference both for better air circulation and for an increased range of motion. On top of that, the UPF 50 sun protection supplies yet another reason to make this pant your outdoor wear of choice. Travellers will also love the extra storage room of the KUHL Konfidant Air. Offering nine pockets, four more than the typical 5-pocket designs on most other travel pants, there’s plenty of room here to keep all of your travel accessories safe and organized. Need a simple travel pant that’s built for comfort? The Columbia Silver Ridge Stretch keeps many of the important features of the company’s renowned outdoors pants while streamlining the design for a more modern look. The polyester and elastane blend fabric is both stretchy for comfort and extremely functional. Treated with the company’s own Omni-Shield™ water-repelling technology and Omni-Shade™ UPF 50 sun protection, there’s nothing to keep you from getting outside. Besides the comfort, the Columbia Silver Ridge Stretch features several pockets to keep your belongings organized. Travellers will especially love the left-side zip-security leg pocket for stowing away your most important documents safely. The water- and wind-resistant Outdoor Research Ferrosi are definitely not your typical travel pants. 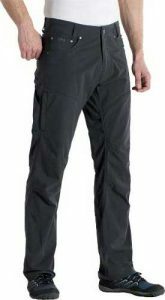 Designed with a softshell nylon and spandex fabric, these comfortable trousers are most at home in the outdoors, even in the harshest conditions. Despite their powerful resistance to the elements, the Outdoor Research Ferrosi remains lightweight and breathable. Thanks to the stretchy fabric and features like a gusseted crotch and articulated knees, they provide a full range of motion to help you undertake the toughest travel activities from hiking steep trails to climbing vertiginous crags. For travellers, there’s an added bonus of several zippered pockets, both in the rear and on the thigh. The Outdoor Research Ferrosi is one of the best choices for staying organized and keeping your belongings safe on the road. Among classic travel pant designs, there’s hardly a better overall contender than the Patagonia Tenpenny. These durable trousers are spun from a lightweight blend of organic cotton and nylon for a comfortable and relaxed fit that’s as perfect as they come. What’s awesome about the Patagonia Tenpenny, especially for active travelers, is its wide range of motion. Thanks to its gusseted crotch and articulated knees, you’re able to tackle outdoor activities without the pants restricting your movement. Unlike many of the slimmer-fitting options on the list, the fit is especially well suited for larger and more muscular frames. To add to that, the Patagonia Tenpenny features a durable water-repellent (DWR) coating that beads off rain when the weather takes a quick turn for the worst. Along with several pockets, including a zippered on-seam cell-phone pocket, the Tenpenny delivers everything you’d ever need in a travel pant all with a style that’ll take you anywhere. For travellers taking to warmer climes, few travel pants outperform the Fjallraven Travellers Trouser. Outfitted with the company’s own G-1000 Air fabric, a water-resistant polyester and cotton blend, these trousers offer superb ventilation even when the conditions outside inch towards the uncomfortable. Like most of our top picks, the Fjallraven Travellers Trouser is extremely versatile. The streamlined and minimalist look works as well on the hiking trails as in the city. Never be afraid to get active when wearing these. The gusseted crotch and articulated knees provide a full range of motion even for the most vigorous of activities. Taking care of your belongings for the Fjallraven Travellers Trouser is a cinch, too. Besides the almost obligatory hand pockets, there’s a zippered thigh pocket and an interior security pocket that makes the Travellers Trouser one of the most secure pants of the bunch. And with a scant weight of just 11.3 ounces and awesome packability, the Fjallraven Travellers Trouser is also one of the most convenient. 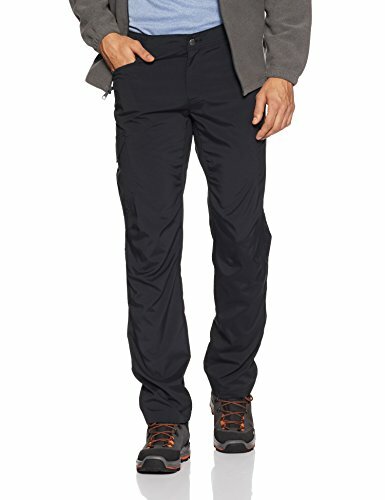 Still having trouble choosing between the best travel pants for men? Here are a few last-minute recommendations. Need an all-around awesome travel pant? There’s hardly a better choice than the Patagonia Quandary or Patagonia Tenpenny. Want to get active on your travels? The soft-shell Outdoor Research Ferrosi is the most unique pant for the active traveller featuring excellent wind and water resistance and a comfortable fit that prides itself encouraging a full range of motion. Getting a little too hot? The two best choices for travelling in warm locations are the supremely well-ventilated KUHL Konfidant Air and the versatile and airy Fjallraven Travellers Trouser. Choosing the perfect travel pants isn’t exactly rocket science. As you’d probably imagine, it’s not much different than picking out trousers as you normally would! Comfortable: Of course, comfort is the most important attribute when choosing your travel pants. You’ll want to make sure that the brand’s fit works with your body. Some styles are made slimmer than others. Read reviews and keep this in mind before you make your choice. The fabric also makes a big difference. You’ll find that more stretchable fabrics such as those blended with spandex will be among the most comfortable to wear for extended periods of time. Lightweight: One of the biggest reasons to pack travel pants is to shed some extra weight in your backpack. Compared to jeans or other “regular” pants, travel trousers often weigh far less. The weight of the pant also impacts some of other features below. Wrinkle-resistant: I’m sure you’ve pulled clothing out of your backpack before only to find they’re all but unwearable because of wrinkles. 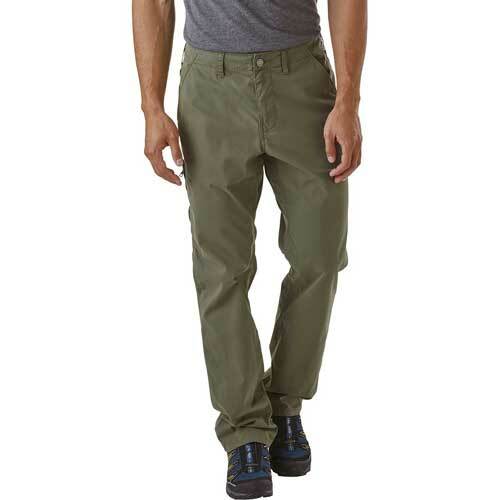 Many of the best travel pants for men are not just lightweight, but wrinkle-resistant. If you want to save time and look good, this is definitely a feature you’ll want to look for. Breathable: As much as I love wearing jeans, denim is hardly the most comfortable fabric in warmer climates. After numerous summer trips to Asia and to Europe, I’ve wised up to the fact that having breathable clothing is super important, especially when it comes to pants. Most of our top picks provide excellent breathability with a few offering extra ventilation options in the knees and/or in-seam. 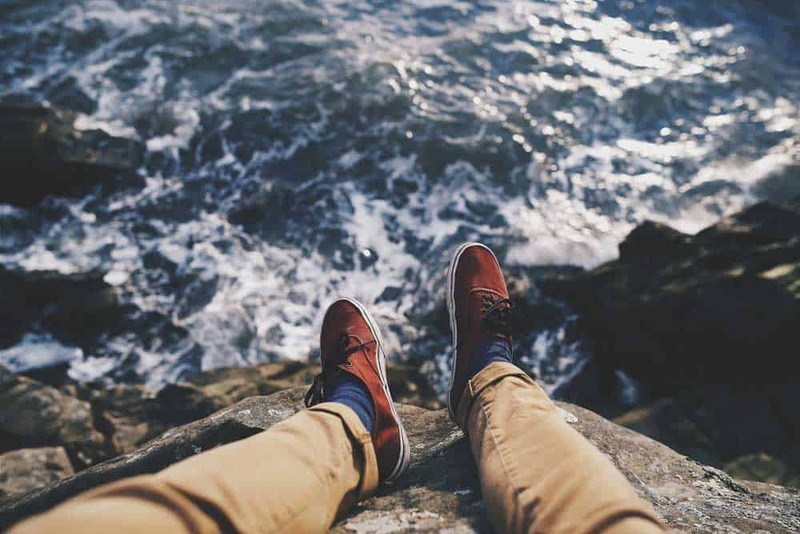 Water resistance: Another key feature of travel pants compared to your regular streetwear is their ability to resist water. These top picks all offer some degree of water repellency. Keep in mind though that travel pants aren’t rain pants. Even the best of the bunch are made simply to repel water, not completely shield you from it. If you’re caught in a heavy rainstorm wearing only these, you will get wet. Don’t say I didn’t warn you! Quick-dry technology: Along with water resistance, you’ll find that most of the top travel pants dry quickly. This is especially important when you’re hopping quickly from place to place. If you’ve ever packed a damp pair of jeans before a long bus ride, you’ll know exactly why this is such a key feature! Sun protection: Believe it or not, getting a sunburn while wearing pants is, in fact, possible! 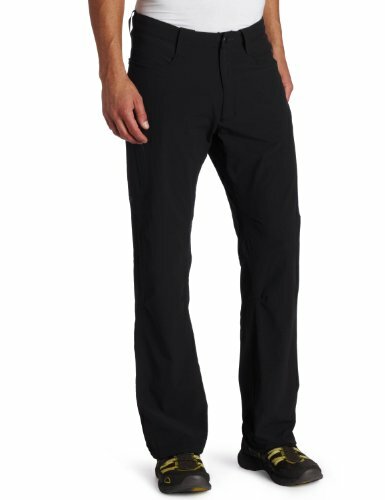 Most of these travel trousers offer UPF sun protection between 40 and 50. Pockets: Unlike hiking pants which are often styled with cargo pockets, most of the travel pants outlined here behave more like a regular pant in terms of storage.